Hope you all were as lucky to be lazy as me. I love parades so was delighted to be assigned to shoot our area parades. The cheesier and the dorkier the parade, the happier I am. I wanna see kids on bikes decorated with streamers rolling down King Street. I wanna see people I know waving at me from the Rescue Squad vehicle. I want sirens, I want politicians, and mostly, I want candy. And, fortunately for me both the towns of Boone and Blowing Rock host such Rockwell-esque hometown parades. 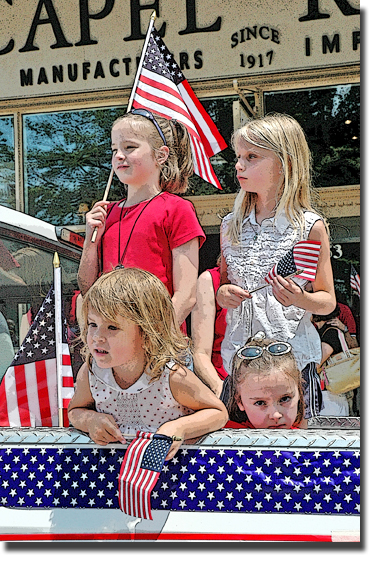 This photo is from the Blowing Rock 4th of July parade. I messed with it in Photoshop hoping to make it more of an illustration. I really like the body language each of these parade-watching girls are sending. This is an honest image.